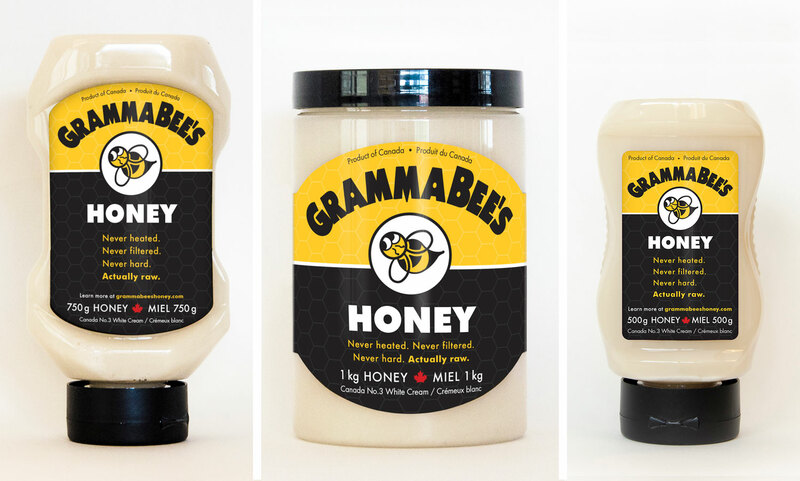 Gramma Bee’s is all-natural, unprocessed, raw, Alberta, Canada #3 honey, but what does that mean? Just because honey tastes so good, doesn’t mean it isn’t good for you. Unlike other sugars, honey is anabolic, medicinal, antiseptic, easy on your blood sugar levels, easier on the liver, and has many healing effects. While refined sugars offer no nutritional value. Why does your honey stay soft? We invented a patented system that can turn raw, crystallized honey into a honey that stays soft forever without the use of heat or filtration. How do you make your honey stay soft? What is your patented process? It’s a secret because it is what makes our honey so unique. And it’s really cool! Will it ever go hard? Is there anything added to the honey to make it stay soft? Absolutely not! What we are offering you is straight up, pure, actually raw Canadian honey! Does your patented system affect the health benefits of the honey? Not in the least; in fact, because we don’t heat or filter our honey it maintains all of its beneficial properties which is unlike other soft honey out there. Eating our actually raw honey is very good for you! No. Pasteurizing requires heating the honey, which we are not willing to do as it compromises the health benefits of the honey. Why is your honey so white? Because we don’t use heat in our process, we can keep the natural color of honey intact, much like the colour of raw, crystallized honey. Soft, liquid, dark or golden honey has been heated, essentially burning the honey to create its colour. No our honey is not organic and we are still on the fence on what our thoughts are about “organic”, its hard to control where a bee flies. We like to call our honey MORGANIC. Do you add sugar to your honey? It tastes sweeter than other honey I’ve tried. We do not add anything to our honey. Sometimes, when honey is heated, it can result in a bitter, burnt taste; since we do not heat our honey, it may seem sweeter than what you are used to. What is the foamy substance on the top of my honey? That is a mixture of wax and active enzymes, safe to ingest and further proof that our honey is actually raw. What are the particles floating in my tea after I add your honey to it? It is most likely wax. 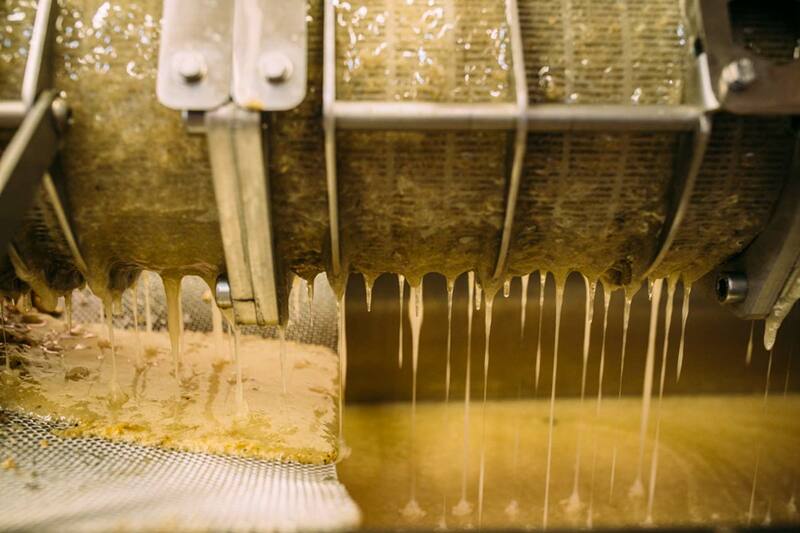 We don’t filter our honey, so some of the wax from the hive stays with the honey during extraction. But don’t worry, it’s safe to ingest. What are the flecks in the honey? Again, because we don’t filter our honey, you may find flecks of wax, propolis or even the occasional bee part in our honey. Don’t worry, it is all safe to eat. Where is this honey from? All of our honey is from the province of Alberta. We recently outgrew our ability to self-produce our honey so we have partnered with another bee keeper in the Grande Prairie area who meets our very strict requirements for bee keeping and honey extraction. What type of flower is this honey? We create our batches using all the flowers available to us in Alberta which includes Clover, Alfalfa, wild flower, ditch flowers, Dandelion, and Canola. We do not produce “single flower” honey (for example, “clover honey”) as we want to ensure each container has a consistent taste. I love honey, but what can I use it for? Honey is great for eating, drinking and medicinal purposes. A few examples are: on toast, in smoothies, as a replacement for refined sugars, in tea and coffee, in baking, and as a nice glaze on a pork loin. Medicinally you can: use local honey for helping with seasonal allergies as it contains local pollens which help to build an immune system against them and it also acts as an antihistamine, use it on cuts and burns as honey contains natural hydrogen peroxide or drink lemon and honey water to relieve cold symptoms. Your honey is labelled Canada No. 3, what does that mean? Why not No. 1? Whoa! This is a big one. So much so we’ve dedicated a whole page to it here. Please take the time to read our explanation as we are sure you’ll find it interesting. Why don’t you package in glass? As a small business, we had to make some tough choices. We are proud to say that we only source products that are made in North America; however, we could not find a manufacturer that would make a glass jar for us that we liked. So, in this case, we decided to get PET jars as they are lighter to ship, they do not break easily, and they pose less of a risk at our facility. Do you ship your honey? Yes, we do. Unfortunately, we have not been able to find a good and affordable way to ship our honey around the nation. We currently do not have an online store so if you are interested, please email us and we will do our best to get it to you. Ideally, we will find a way to save some shipping costs; for example, by encouraging you to order 1 case (6 units) or more at a time. Unfortunately, we have not been able to find a good and affordable way to ship honey around the nation so we do not prefer to sell online. However, if you email us we will work very hard to get our honey to you. Ideally, we will find a way to save some shipping costs; for example, by ordering 1 case (6 units) or more at a time. Should infants under 1 year of age or pregnant women eat your honey? Honey has the risk of carrying Botulism spores and therefore it is not recommended for infants under 1 or pregnant women. You should consult your physician if you have further questions or concerns.